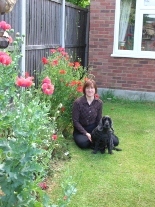 My name is Jill, that’s me in the photo with my 12 year old Cocker Spaniel Oscar. I have been a dog owner for over 25 years and have kept all kinds of pets including rabbits, mice, hamsters and birds. I have lived in Upminster for 18 years and know all the good walks (just ask Oscar). I would love to look after your pet and make sure they get all the exercise and companionship they need, if you have any questions please call me and I will be happy to answer them.